My 3-year-old son, Philip, really loves letters and numbers. I think that he must have gotten it from his dad, the math geek. Long story short, I enjoy teaching him math and introducing him to apps for learning about numbers and basic math operation. Today, I would like to share an app that I believe is appropriate for toddlers who are new to math like Philip. It's called Mathlandia, a fantastic app by PopAppFactory that can be used for juniors as young as one year old. 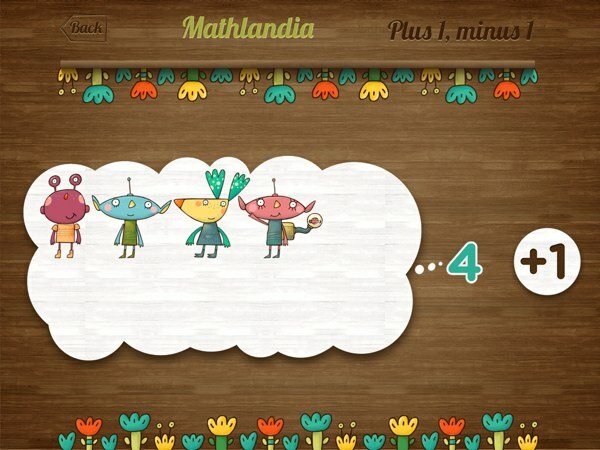 Mathlandia is a cute alien-themed app for introducing basic math operations to young juniors. 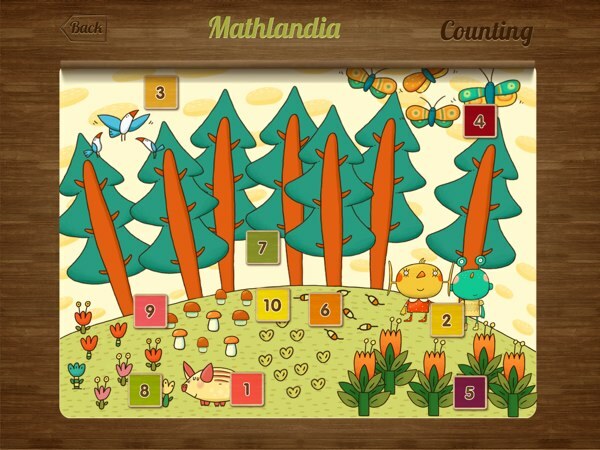 Mathlandia is a collection of six mini games which are ordered according to a junior's learning curve. They focus on number recognition, ordering, counting, and basic math operations such as addition and subtraction. They also have a unified theme across them, which is cute and colorful aliens. The first mini game in Mathlandia is the number introduction game. This is probably the only part of the app that is suitable for younger juniors, such as my 1-year-old Noah. The game shows a number, starting with the number 1, followed by the same number of colorless extra terrestrials. You need to tap on each of these aliens to count them. Once all aliens have been counted, the game moves on to the next number and continues until you reach the number 10. In the second game, you are asked to drag and drop randomly numbered squares to their respective places at the center of the screen. For each number, the game shows a speech bubble that shows the same number of aliens. The next game illustrates the basic concepts of counting using two different game modes. First, it shows a colorless illustration containing 10 different groups of objects that represent the numbers from 1 to 10. For each group, you are asked to tap on all identical objects that belong to that group. When you have found all identical objects in a number group, a numbered square flies to one side of the screen to mark the group as completed. Once all 10 groups are completed, the game takes you to the second game mode where a new colorless illustration is shown. You are then required to drag the numbered squares that you collected from the previous game mode from the sides of the screen to the object group with as many members as that number. In Numbers Order, juniors learn to place numbers in order. The fourth and subsequent mini games in Mathlandia are more appropriate for juniors aged 3-6. These games focus on the basic concepts of addition and subtraction. The fourth game sees the app incrementing the number 1 to 10 before decrementing it back to 1. Throughout the game, a big bubble shows a number of aliens that is as many as the the number shown on the right-hand side of the bubble. Each time you tap on the +1 button, a new alien shows up and increase that number. Similarly, tapping the -1 button removes an alien from the bubble and decreases the number by 1. The last two games take the basic concepts of addition and subtraction to the next level by no longer restricting the math problems to adding or subtracting by one. Instead, the app shows a number of object that you must count by tapping on each one. The result is then shown as the left-hand side operand of an addition or a subtraction operation. An alien spaceship then shows up and starts beaming things up or down. In the addition game, it beams down a number of objects to add to the existing ones, whereas in the subtraction game, it encircles a number of objects to beam up. Tapping on these encircled objects let you know the right-hand side operand. Upon the games' completion, all the objects are restored and you need to tap to count them again. The result is be shown at the right-hand side of the equation as the end product of the math operation. Mathlandia features a great narrator voice. Everything is spoken slowly and clearly. It's very helpful to guide juniors, especially the young ones, as they play the mini games. The app is also designed to handle the player's mistakes gracefully through subtle audio and visual feedback. Although gentle, I believe that these are clear enough to notify the player of their faults. The app also cleverly disable its tap responders whenever an alien has been tapped for counting purposes, to prevent double-counting mistakes. The app differentiates plus one and minus one operations from the standard addition/subtraction operations. I really like the quirky yet cute alien theme that the developers have chosen for the app. I find that using an alien spaceship beaming up and down a group of objects to illustrate the concepts of addition and subtraction makes them amazingly easy to explain and understand. I also appreciate the subtle animations which you can see throughout the game, such as the waving trees in the counting mini game and the way a new alien would wave as he enters the bubble in the +1 mini game. What a great attention to details! I also appreciate that some of the mini games have great replay values. For example, the counting game shows different paintings and shuffles the placement of objects, so you will find a new scene to play with every time. The addition and subtraction mini games can also be treated like workbooks that juniors can replay as many times as they like to practice their skills. Finally, I like the way the app is able to draw appeal from both my sons, and each of them can reap benefits from the app in different ways. Noah can enjoy the first mini game, whereas Philip can learn the basic concepts of addition and subtraction through the last three mini games. The way that the app differentiates the +1 and -1 operations from the standard addition/subtraction operations is an excellent design decision that eases the learning curve for Philip. The app illustrates the concept of subtractions using an alien spaceship that beams up objects. Mathlandia is an excellent math app that appeals to juniors 1-6 years old. Its cute alien theme has proven to be effective in drawing the interests of my juniors. As a parent, I'm glad that I have found this app, and I would recommend it to anyone whose juniors are starting to learn basic math concepts.